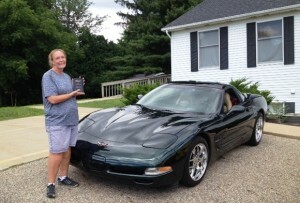 Our July club car of the month is owned by Dee English. In 2015 after a trip to Bowling Green, KY with some friends and after riding with the NCM professional racecar drivers Dee was hooked. So after they got back from Kentucky Dee searched the Internet for hours looking for a used Corvette in decent condition. 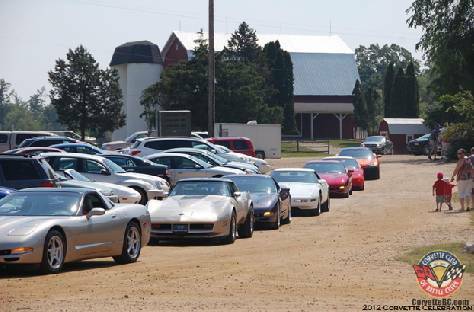 They had just turned in a 1999 corvette for a new 2015 Corvette Stingray, about 3 months prior to the trip. Little did Dee know she would hit the jackpot. Brett and Dee then traveled to St. Clair Shores (North of Detroit) to see a 2000 Chevy Corvette with 10,700 miles in pristine shape in the color of Dark Bowling Green. This car was the odd duck of our new fleet, as it was Green and not black. They brought this home the same day of the U of M and MSU game on October 17th. They sent her to the mechanic and replaced the electronic brake Control Sensor and fixed the Air conditioner Compressor, and then she had to go to storage for winter. As the snow cleared in 2016 this 16 year old car that was barely broke in by its previous owner, she had the best of all years. She has won 2 car shows, got best of show, several plaques and trophies, then gave Dee the ranking of 5th in the state, Rookie of the year, and 30th in the Nation. This has been one of my favorite toys. Little Red, her daughter Peyton loves to be her #1 passenger.